This week's entry is the front entrance to what used to be Border's books on the corner of Washington and School Street. I took this shot three weeks ago on one of the very last days it was open. Now there is no bookstore in the downtown area, just as in many other American cities. It's a sad fact, here in Australia too, although we still have Dymocks, Borders was such a good place to browse. Great shot. How can people live without bookstores?! Your beautyful picture is already part of history, a good thing that you took it.. It's a pity the bookstore now is closed! What a shame, went in there when we visited the city a couple of years ago. Took a photo in their coffee shop, think it's somewhere on my blog. It is just heartbreaking how many bookstores have closed down recently! It is happening all over the world. I guess it is inevitable though - buying through Amazon (especially in the UK) is cheaper and easier. Lovely shot! I like the use of monochrome in this photo. Independent bookstores on the horizon? That photo looks really old. Who needs books? Reading is greatly overrated. It is just a way of passing knowledge on, and, like, that is so lame. I love the way BW images of buildings often makes them seem so timeless. Bookstores are closing, such a shame. 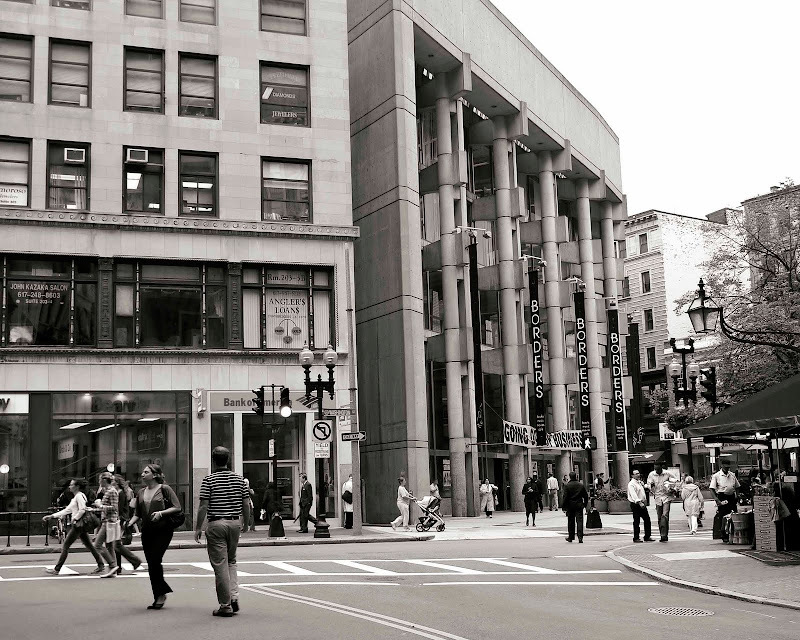 So sad - I used to work on Franklin Street and spent many lunch hours browsing and shopping at Borders.